‘‘Hunting for northern lights’’ is a phrase you hear a lot, but I doubt that most of the people understand exactly what is meant by that. It might seem that the ‘‘hunter’’ need to possess specific tracking skills to catch the elusive ‘‘aurora’’. It´s actually not that difficult and I will explain how to use the available information on the internet to go out and ‘‘hunt’’ yourself. In essence, there are two major factors that you need to take into account - cloud cover and geomagnetic activity. There are number of resources that you can use to calculate your chances to see northern lights. I used to combine information from number of web pages to come to a conclusion on how likely and when will aurora show itself. Just recently a new web page was launched that has gathered all the relevant information, so there is no need to go through each one anymore. Address of this web page is http://auroraforecast.is/ and I will break down what does the each section there mean and how to read it. At the bottom of the page you can follow cloud cover forecast for Iceland. 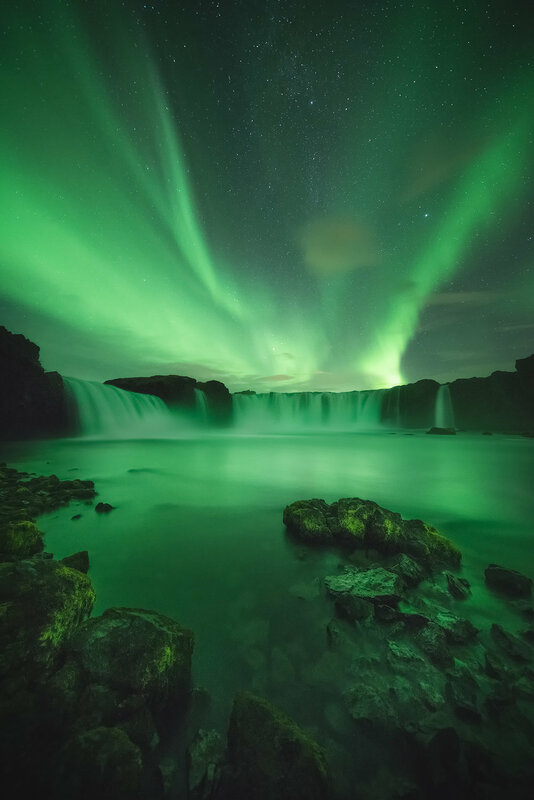 Northern lights appear high above earths surface, so any cloud cover will obstruct the view and even with high geomagnetic activity, you will not be able to observe northern lights. In this cloud cover map you can switch between different altitudes at which clouds might appear. By default, you are given the reading of low and mid level clouds, as they are the most densest. Generally, northern lights can be seen through high cloud cover, but with full moon and low aurora activity, high clouds can pose difficulties to clearly observe them . Next up is the KP index forecast. Index itself has a scale from 0 to 9 and is used to determine the chance of seeing auroras depending on where you are. In Iceland KP index needs to be at least 1 to have any chance observing them, and even then, it would be visible only in the north of the country or very close to the horizon. For a decent ‘‘show’’ you need a KP index of at least 2 or higher. While KP forecast is a useful tool, its by no means the most reliable. In my experience, many times the predicted KP index has been completely off, and I have observed northern lights under 0 KP forecast and seen none with a prediction of KP 4 and higher. Actual aurora activity very often can exceed predicted KP index (in short 10-20 minute bursts) or never reach the predicted average. Solar wind speeds, which are also shown on the website, is another good way to predict how intense aurora might be. Higher the speeds, more likely that these charged solar particles will have enough energy to penetrate part of the earths magnetic field and release their energy by interacting with particles in the earths atmosphere. The most important and unsurprisingly, the most difficult aspect of ‘‘northern light’’ hunt is predicting the actual time when they might ‘‘come out’’. SO called Auroral oval is one of the tools you can use to determine the timing. As the map shows, a curved green band covers part of the northern hemisphere and this band slowly moves clockwise. Areas that are covered by it has a higher likelihood to observe northern lights. Also, intensity is shown with different colors (from green to red), with dark green representing low activity and red - very high. This map shows a 20 minute forecast of the intensity and current position of the ban, so when looking at how close it is to Iceland, you can proximate the time, when lights could be observed. There´s actually another way to predict when exactly lights will appear over Iceland - webcams from Norway. You can find live 360 degree webcam from Tromso in Norway, that show current aurora activity. As Tromso is further north than Iceland, light aurora over there might not be visible in Iceland, but if you can see strong aurora over Tromso, chances are, in an hours time aurora will also be visible in Iceland. I hope that some of you will find this information useful. Happy hunting!